Halloween is almost here! I love the elegance in these photos from Sky Born Visual. 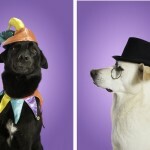 Nada Khalaf-Jones photographed her dogs for a spooktacular Halloween styled shoot. 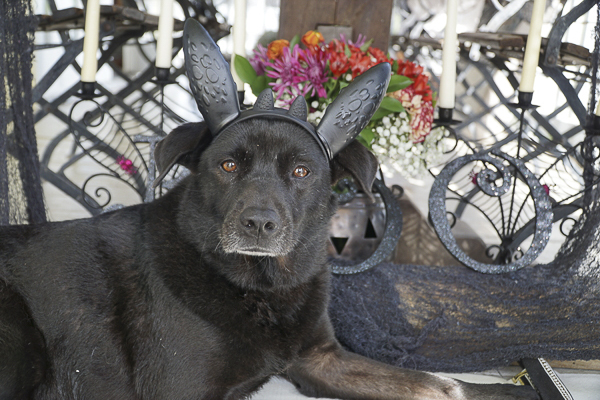 From Nada: “We love all things dog and all things Halloween. 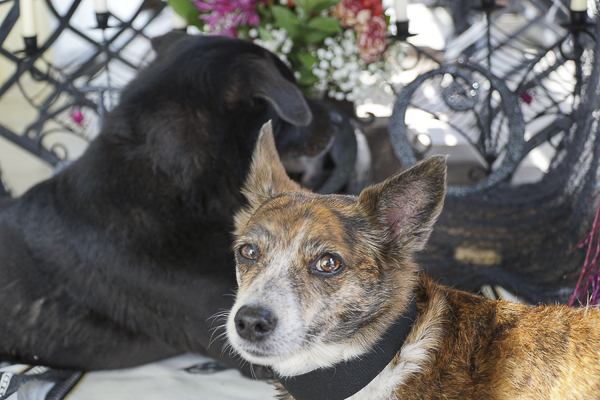 Tinker Bell is our 14-year-old rescue puppy; she’s the star of this Pumpkin Spice Halloween & Flowers Concept. You can see why she is the Pumpkin Spice Dog, her brindle fur and pretty face make her the best pup for the job. She even shared the limelight with her younger sister Sasha, quite spookily perfect. 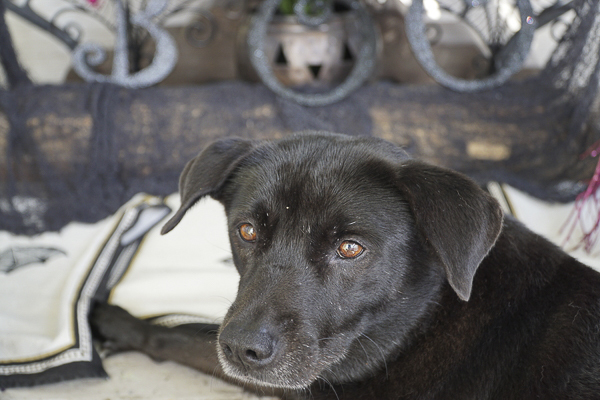 Sasha is a black Lab mix rescue. And while she isn’t the star she still manages to pull off a convincing ‘Toothless’ costume, remember that cute character from ‘How To Train Your Dragon?’ well we think Sasha is perfect equivalent in the dog world. Except she insists she is a ‘Drog-gone,’ and that is even better. Follow Sky Born Visual on Instagram. About Sky Born Visual: Based in the Florida Keys, Sky Born Visual offers videography for weddings, real estate and more. Amazing pictures! Tinker Bell looks awesome for 14! I hope my boys look as good at that age. Love all the decor and the dogs add just the right touch. How do the dogs feel about pumpkin spice treats? You know I really appreciate your positive feedback. THANK YOU! I bet they’d love to try pumpkin spice treats. Tink usually sneezes at anything spicey. But she loved the pumpkin nut bread she had today at the school social! Okay, now THIS is what I call Halloween fabulous. What an amazing decor with such adorable pups!! Thank you!!! I adore this so much and there is more to come. We also love the season and dogs all together warm and cuddle up with the family. I know the DailyDogTag will enjoy more of our images. So check back soon. Love the response here. Giving me the chills!! Yay! Kelly! Thank you. They really do love their Halloween! I’m sure you’ll love the next images and a film we hope to share with DailyDogTag’s readers and fans. 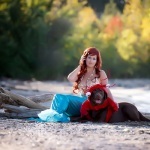 Tinker Bell is the perfect Pumpkin Spice dog. Lucky colors I guess. Thanks for checking in. We loved making these images. Spook to you later. 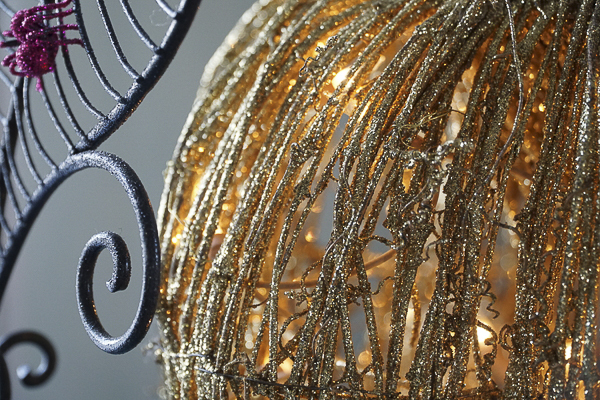 Gorgeous photos, decor and dogs. What a great way to celebrate Halloween without making the dogs uncomfortable. They look great. You nailed it! I was looking at costumes and really didn’t get the impression it would work for me, so why would it work for them. You know? It’s really warm here too. So no full body suits, nothing restrictive. The next images from us will have some more inspirations. Check back here soon on the DailyDogTag. Ooooo, the All Hallows Eve film sound intriguing! I’ll have to watch out for that. These two cuties are eerily adorable! Happy Howloween!! It is in production. So let’s see when we release it. If you check back here on DailyDogTag I’m sure it’ll be released. If not it’ll be on the website below. Thanks. I’m excited too!! I love a pup who loves Halloween just as much as I do! 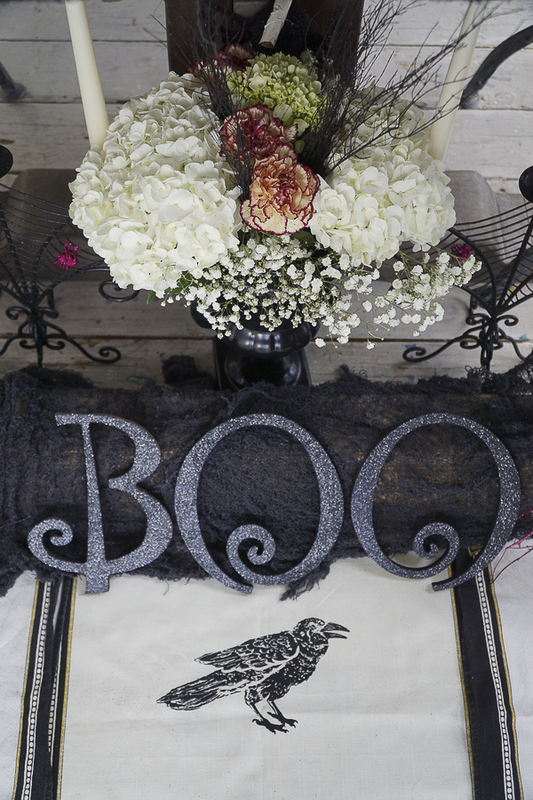 Spooktacular photography and love the decorative styling for the shoot. They really do love it. It’s like the humans all get together and talk to each other in a big gaggle and they get to watch! And get a treat here and there. This is so cool. I had no clue so many people liked dogs and Halloween as much as me!!!!!!! Tinkerbell looks adorable! Love the decor as well. Happy halloween! Thanks Paroma! You too. Tink is the sweetest Pumpkin Spice Puppy. We love Halloweenand Dogs!! Hooray! OMG HER EARS! What an adorable, non-stressful idea. Love this! You nailed it. Totally low stress. 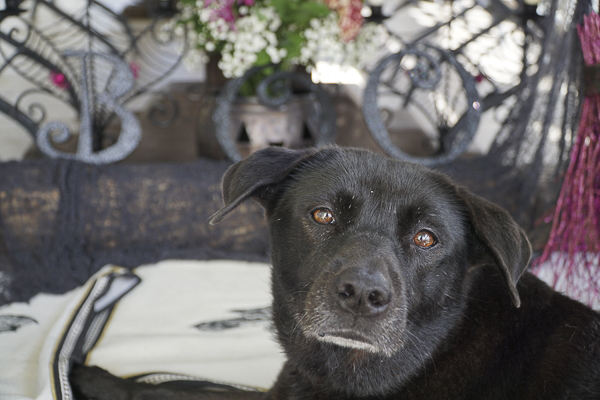 Just loved the styling and my ten year old is the dog whisperer so we had a team effort. Thank you sooooo much for your digital hug! Yay! We are glad you liked it. Thank you. Tink is def. the Star. Not sure how to get Sasha to look less ‘serious’ she is an intense personality!!!! Happy Halloween! This is such a cool set up for Halloween pictures! These two are adorable! Thank You Karlee. 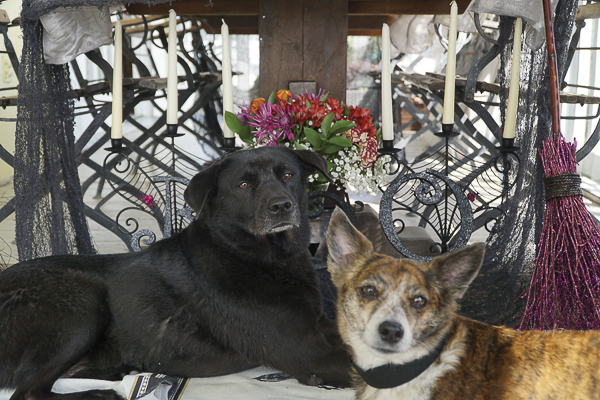 Well the floor is their domain and the table and chairs are so rustic it wasn’t tough to throw that gauzy cloth down and put the pups there with the flowers etc. 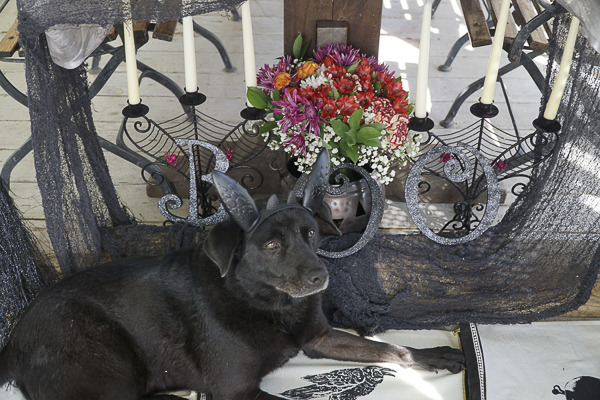 As I said to some of DailyDogTag’s commentators above: it’s a few essential pieces like the metal jack-o-lanterns and the linen table decor the rest is black spray paint, black glitter and a simple head decor plus, the most important, happy puppies who just went for a run w mum. These are the cutest pictures! Your dogs are so well behaved. 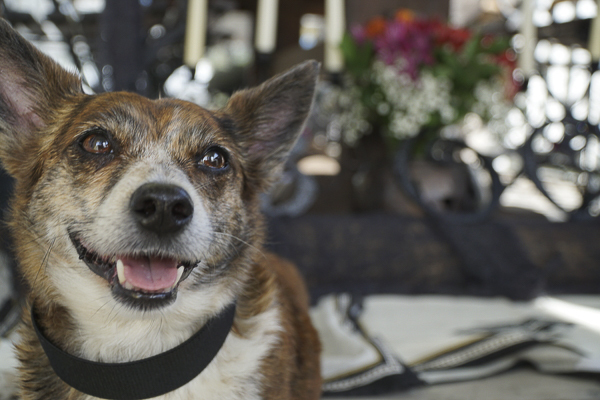 Whenever I take photos of our dog it takes 3 people and many many treats! TInkerbell is just adorable! People!!! Me especially!! Thank you! I wish I was that creative! I love the decorations to accompany the adorable dogs. By the look of your cat logo creativity is something you appreciate greatly. Which means you are so creative. Wish no more. Simply follow your instincts and don’t second guess when it comes to experimenting. I’ve fallen flat on my creative face plenty. But it’s always better to keep creating and have your own moments to fuel and energize you. Make it yours:)) these are just put together from a Love for creativity! You have that. Looking forward to yours images!!!!!! Oh my dog. I love Halloween and these images capture the essence of the holiday to a t. Such classic photos. OH MY DOG!! I love that expression. Thank for reminding me. It was so much fun and there is more. DailyDogTag Amy be featuring some more of these two soon. Check back again and thanks for the reminder of the expression. Hahahahaha! Happy Halloween! What cute pups! Halloween is my fave! 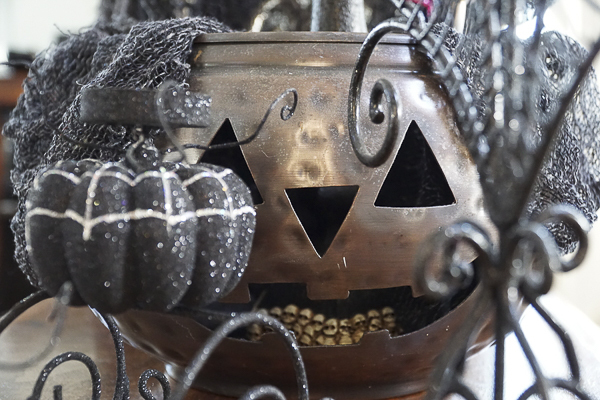 I really love that metal jack-o-lantern you have in your photos! Shayla ! What a lovely name. 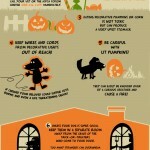 The Jack-O-Lantern was a Lowe’s or a Home Depot purchase. I saw one on Halloween that was platinum colored with darker trim. I loved these: they were nesting, so three, each one smaller than the last. What fun though. And thanks for checking in here. I’m sure we will e sharing some new images and a film soon. All the best!!!! Great photos! And your dogs look like the enjoy the fuss! Thanks Dr. Leigh we really enjoyed the making of this. As I was saying a few comments up, it helps when they’ve had a run and aren’t all ANTSY! Plus my ten year old dog whisperer makes them behave in the nicest way. She will be wasted as anything other than a vet. Thanks for taking care of all the animals you care for. 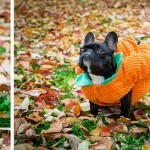 Check back in for more dog Halloween and fall plus a film. It may be on DailyDogTag or on the site below. All the best.